Greetings, my droogies. Let us begin with my death-defying tale of traffic horror! Okay, it’s more like a sad little story about a 2-stroke car and an icy road, but whatever. I was driving back to Ottawa yesterday morning in the wake of Ontario’s biggest snowstorm in years, being my usual speedy, confident self. I was on the 416, 20 minutes from the exit on to the 417 and Ottawa, and making good time for teaching my Global Health class at noon. But I was suddenly and incomprehensibly overtaken by a wave of responsibility. “Lord Wat”, I said to myself, “Maybe we should pull over and fill up withe windshield wiper fluid.” See, the fluid had just run out and the windshield was getting a tad foggy. “Fine advice, Wee Mortal,” Lord Wat said unto me. And we slowed to a crawl and gingerly inched onto the highway shoulder, intending to pull far from the traffic and thence re-stock the fluid from my supply in the trunk. But noooooo. The little rented putt-putt rolled over a patch of slippery packed snow and suddenly spun out of control, spinning about 200 degrees across both lanes of traffic. Had there been an oncoming vehicle, I would have been toast. But I had deliberately chosen that moment to pull over because there were no vehicles coming. The car careened into the centre median, becoming lodged in a snowy ditch, facing toward the oncoming traffic. My biggest fear was that it would also topple over, but luckily that didn’t happen. The only thing bruised between me and the car was my fragile ego. I called for a tow and sat there for about an hour, blinkers on and hood flipped open. It was an opportunity to study the altruistic nature of my fellow Ontarians. In that hour, a hundred vehicles must have gone by. One on my side slowed enough to signal to me; I waved him on. But on the other side of the highway, a commuter stopped his car and trudged across 40 feet of mucky, knee-high snow, perhaps ruining his suit and shoes, to check on my welfare. I was verily moved by his concern and thanked him profusely for his efforts, however unneeded they might have been. And lastly, one of Ontario’s finest eventually rolled up alongside me to check things out. Let me say, I was very impressed by the OPP officer’s concern for my well-being. He needed several reassurances that I had heat, water and a phone before he, too, drove on. Sitting in a ditched car on the side of a highway in the middle of a snowstorm, with my trusty Treo and 5 CDs of The Ongoing History of New Music for company, I was actually able to get a lot of work done, even confirming that my TA and another professor would take my class. The tow was quick, however, and quite a learning experience. I was able to make it to my class 15 minutes late, trundling in, wet and muddy, to be met by the giggling faces of my no-doubt bemused students. The lesson: had I just continued on at my break-neck pace without stopping to re-fill with wiper fluid, I would have been completely fine. Lastly, I have just this second purchased a One Laptop Per Child laptop. This is a development initiative intended to provide a robust, usable laptop computer for every child in the world, especially those denied a standard education. For every one that an American or Canadian buys, one is bought for a poor child in the Developing World. Or you can just choose to buy one for the child. There are criticisms of the development model, but there’s no denying the purity of intent or the quality of the product. Cheap, robust laptops like this one –as a direct result of this humanitarian project– will become the industry norm. Before that happens, I want this project to get a true opportunity to work, so I’m putting my money where my mouth is. 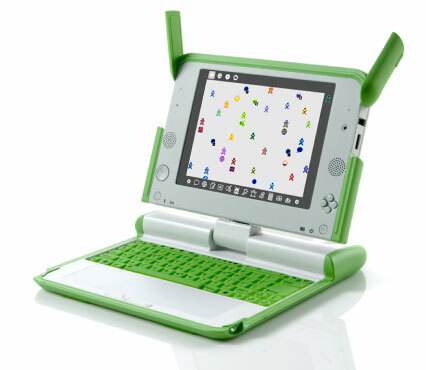 To read about the project and to buy a laptop yourself, visit the OLPC site. Here she is; ain’t she a beaut?